Here’s an unscientific look at some of the finest — or most memorable — things I ate during a year or so of wandering around Southeast Asia. Warung Sari Alam, Ende, Flores. Indonesian food is delicious. As I learned soon enough during my time there, Indonesian food is also exceptionally repetitive. Once you’ve burned through the quotidian pleasures of nasi goreng, rendang, kang-kung, and satay, one quickly realizes that it is about what’s on offer in most places. The selection tends to drop down to rendang, fried chicken, and squid in coconut milk in most places in Flores, a remote section of Indonesia that sees few tourists and doesn’t exactly have access to the monstrous infrastructure of the fast-food world. I did discover an excellent buffet-style warung in Ende, Flores, a town of stunning natural beauty not exactly renowned for its cuisine. It’s called the Warung Sari Alam and is located on Jalan Ahmad Yani on Flores. You order like at most warungs: go check out various cauldrons and containers of food, point at what you ike, and pay according to your selections — it’s not going to be very much whatever you do, so you have license to go nuts. Ask them to add sambal and you’re golden. Do not panic upon realizing that nothing is refrigrated or even kept particularly warm. The particularly oily, spicy nature of Indonesian food tends to keep stuff from delving into food-poisoning land. 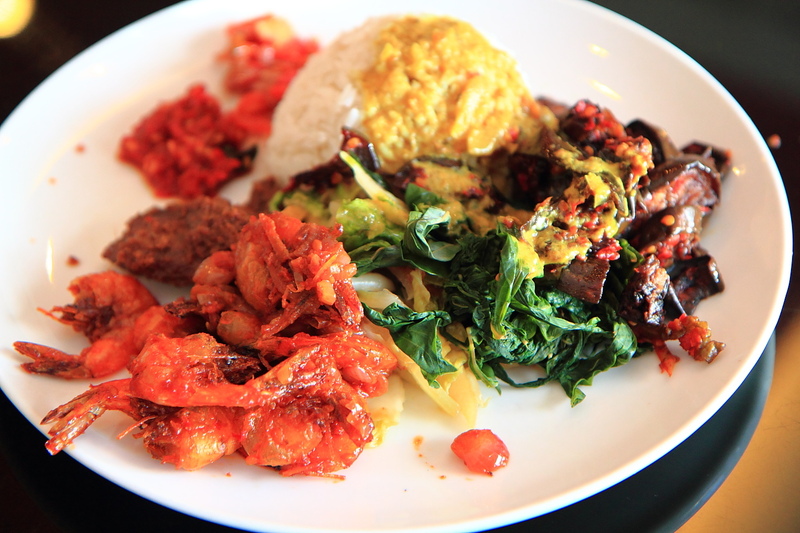 The above image portrays a fairly typical, if unusually delicious warung plate, complete with stir-fried sambal shrimp, chili eggplant, kang-kung, rendang, coconut curry over rice, and a selection of excellent home-made sambals. Whoever transports this concept to the US and manages to make it hip will become fabulously wealthy. At least on the coasts. My favorite restaurant in Manila has a theme: bishops. No, really, it’s called the Ristorante delle Mitre and every item on the menu is a favorite of a Filipino senior priest, bishop, or archbishop. The religious theme extends to the kitchen: the staff are nuns, and many of the customers are members of the Catholic clergy in one role or another. The food is Filipino-Spanish and reminds me very much of the Cuban food I grew up with as a unicorn-like native Floridian— perhaps not surprising, as the food of Spanish colonies seems to evolve in rather similar ways. I had an excellent creamy seafood chowder, followed by a dish of tender braised pork knuckle served over plantains in a rich brown gravy. 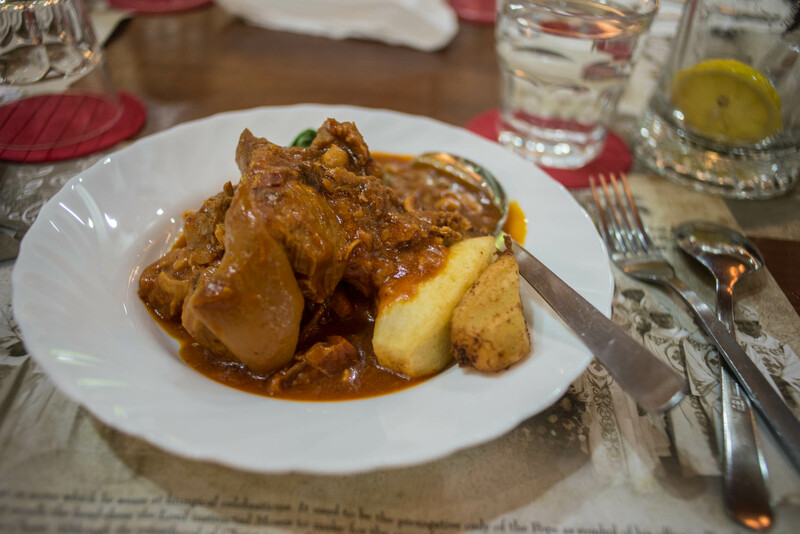 Other favorite dishes include citrus adobo, sinigang, crispy pata and other stand-bys. Even the coffee is pretty good. The dining room reminds me of the quiet Cuban coffee shops I know from my Florida visits, all wooden accents and yellow walls, and features various jaunty bishop accessories — including sparkly hats, vestments, and many and sundry images of Jesus. Nip across the street to the San Agustin Church for the whole Catholic immersive experience. I will admit to the world that I am not a huge consumer of carbs. I am not one of those loathsome paleo diet people, nor do I need to engage in a course of slimming: I simply find I feel better if I keep my carb intake relatively low. It’s not a militant rule — people with militant dietary rules are rarely invited back to parties — but I was nevertheless delighted to discover that a few special Bangok eateries will make their pad thai with stir-fried green papaya instead of rice noodles. Such is the case at Pad Thai Ari, a quiet little lunch spot near the Ari BTS stop. I stay at the Chew House guesthouse right over here and always stop in at Pad Thai Ari when I’m in Bangkok, although I have a remarkable talent for walking the wrong way down the street to get to it. Open by 11, it caters to a crowd of Bangkok lunch-types, and the choices for pad thai, er, stuff, are manifold: rice noodles, ramen noodles, papaya, egg noodles, macaroni, you name it! You can order pad thai with small shrimp or big shrimp: I always go for the big shrimp, which are hulking, juicy beasts with delectably juicy heads. Always eat the heads. Wash it down with a hibiscus juice, thank me later. I admit to knowing little about the Shan people of Burma and even less about their food. Other than that it is delicious. 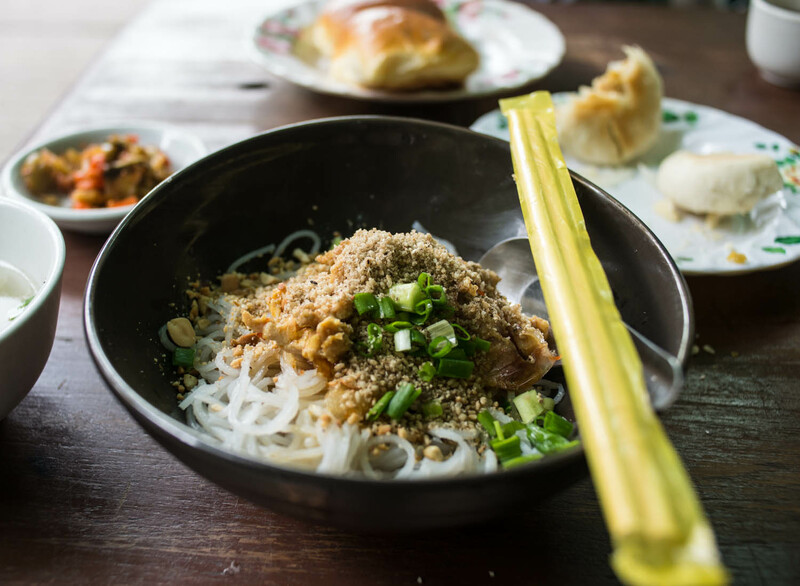 A contact of mine invited me to meet him at the Aung Mingalar Restaurant in Yangon and I was pleased to make the discovery, as long-time fan of the coconut milk and chicken Shan noodles that pop up throughout the streets of Burma. To go with our soup Shan noodles, we ordered steamed dumplings: which came out with a surprising and incredibly aesthetically pleasing fried dough topping. There was something incredibly personally satisfying about stabbing through the crispy dough to get to the hot dumplings: an aural and textural experience that I was pleased to encounter. I wish more dumpling-shillers would do this. Get on it, people. 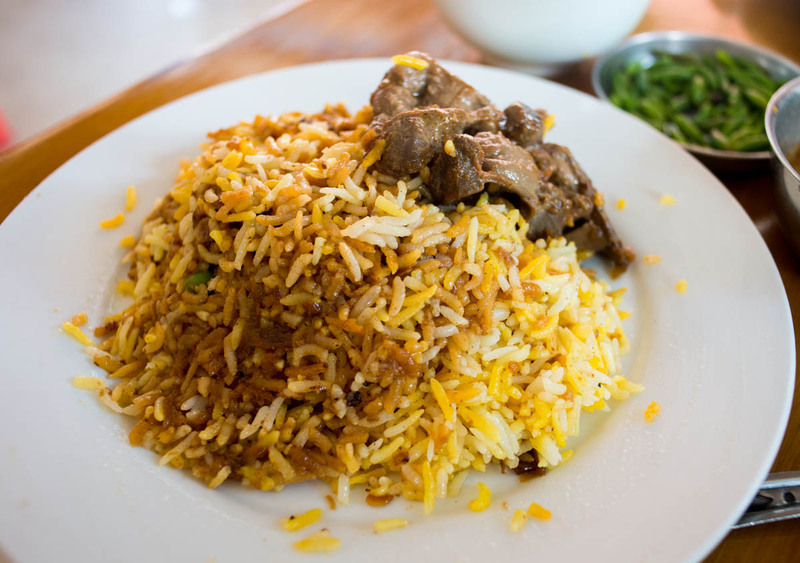 Biryani is one of Yangon’s most famous and most rewarding food-stuffs, an Indian dish brought to Burma and transposed through local sensibilities. Fast food joints haven’t really hit Burma (yet) and the biryani shop fills the gap: cheap, greasy, good, and quick. Rice and meat and grease are cooked in enormous pots set up outside the restaurant, and you’ll usually get a choice of at least chicken or mutton. But to my mind, the holy grail is chicken liver biryani, one of the most obscene-tasting foodstuffs I’ve eaten in Southeast Asia. Greasy, gamy, chewy, and mildly dangerous, I always have to subject myself to the tender pleasures of chicken liver biryani when I find myself in Yangon. Extra points if the outlet you’ve found serves plain yogurt to counteract the funk. Where to find it? Look around Yangon, look for silver pots, chaos, a lunch-time crowd and a particular turmeric whiff in the air. It is then evident. Good food is usually not a staple of scuba-diving resorts, and especially not in Flores, where the quality of local food is usually best described as “mostly edible.” The Ankermi Happy Dive in Maumere proved a happy exception: their little kitchen turns out enormous, delicious portions of Indonesian staples with fresh ingredients. I tend to come out of the water ravenously hungry post-diving (usually for fish, which is perverse), and you can imagine my delight at being presented with this lovely Indonesian fish curry as I slowly drip-dried. 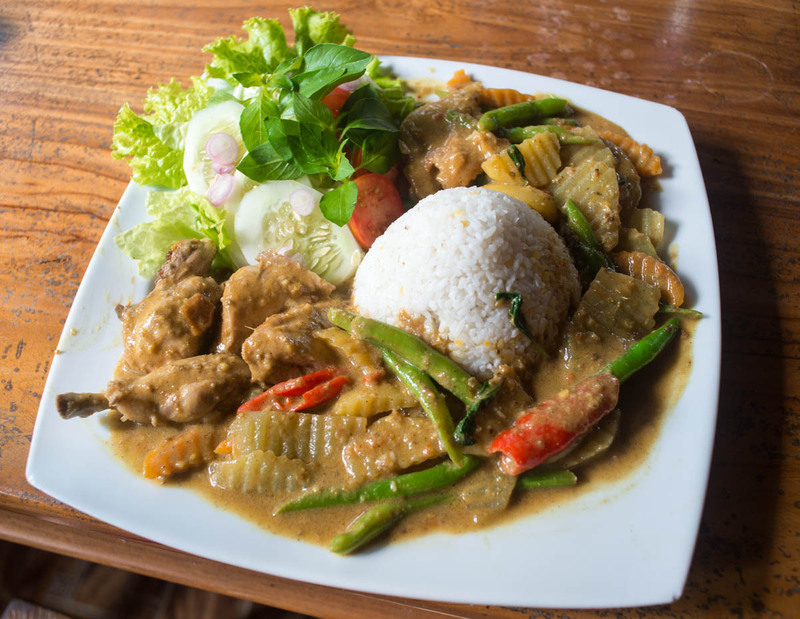 Indonesian curry doesn’t have the complexity of the Indian varietal, but with the right blend of spices and a dash of coconut milk, it can delightfully gritty and earthy. The kitchen here threw in some squash and whole red chilis, which was an added touch — and dark meat chicken, since white meat chicken is best reserved for dogs and weight-conscious Californians. Ah, babi guling. 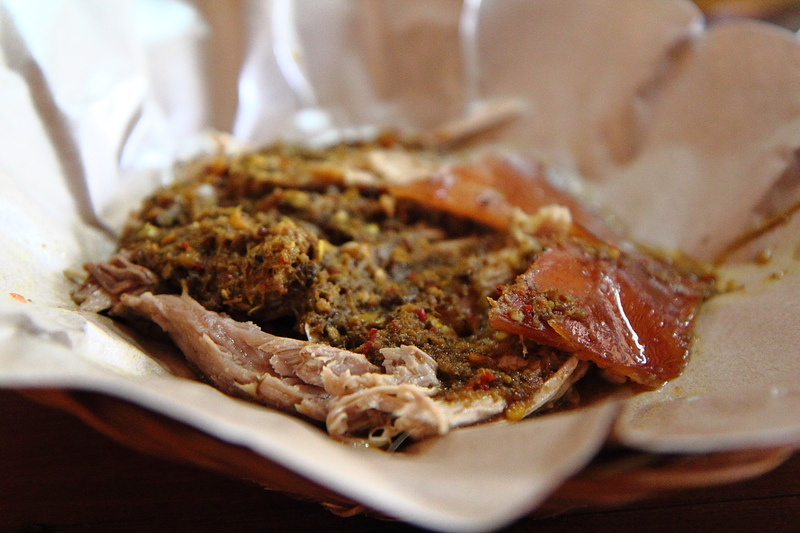 Most Indonesians aren’t keen on pork, as the vast majority are Muslims, but Bali presents a delicious exception to the rule with their local speciality of crisp roasted baby pig. In Bali, pigs are roasted over spits, bathed with coconut milk and secret spices, and then served with spicy, slightly dry sambal, as well as a entirely delightful side of the crispy skin. If you’re lucky, you’ll also get some pork bone soup to go with. There’s a lot of places to eat babi guling, but the stand-by of the genre is definitely Babi Guling Ibu Oka, which has multiple locations in Ubud and tends to do a cracking business with tourists. Tourists aside, it’s delicious babi guling, an outlet is located right next to the Ubud Royal Palace, and you can also order a sampler with Balinese-style sausage if the urge strikes. They’ll wrap it all up in a convenient cone for you if you’re a workman or just compelled to work somewhere, as can be done with seemingly all food in Indonesia. I first went to the Golden Star with a friend in November, and wrote a glowing review of this appealing little side-street tea house owned by an exceptionally gregarious family. These are dry-style Shan noodles, a delightful breakfast concoction of chicken stewed in coconut milk, peanuts, and scallions, served with chicken broth that you can pour over at your discretion. Something about this elegant little breakfast speaks to my depths: something is comforting to the psyche about hot aromatic noodles first thing in the morning. 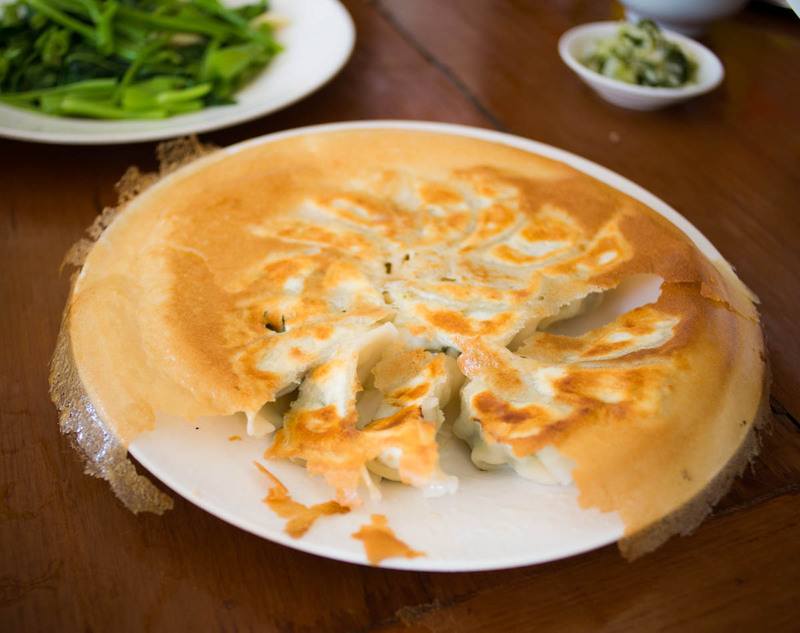 Pair with one of the flaky pastries the Golden Star family churns out in their small leafy courtyard: the morning is established. Wat Ek Phnom is an 11th century Angkorian temple located outside of the quiet river city of Battambang, in the northwestern bit of Cambodia. 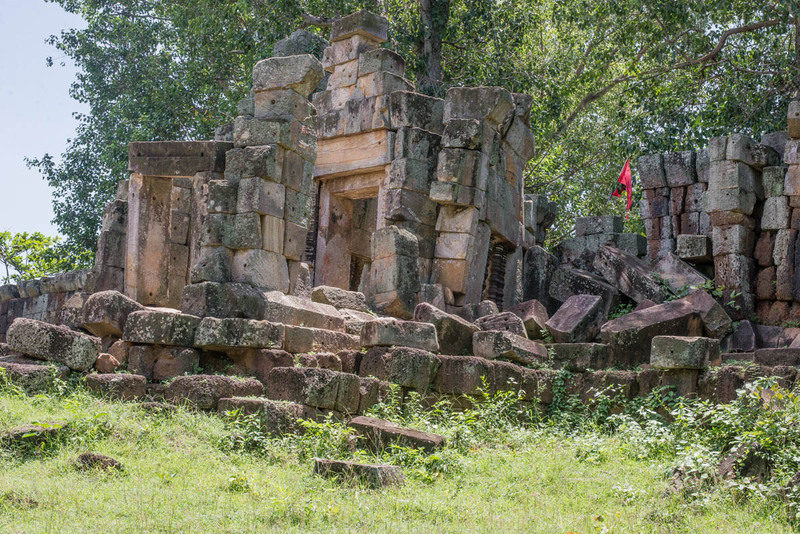 Quiet even in the heart of tourist season, this small and poorly-kept-up temple may not possess the majesty of Angkor, but is an interesting reminder of Cambodia’s powerful past. Temples not unlike Ek Phnom are scattered across the country, reminders of the time when the people of Angkor dominated Southeast Asia. 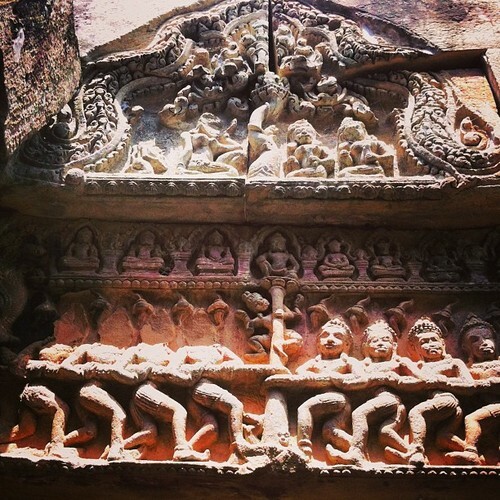 Within the temple, you’ll see a rendition of the Churning of the Sea of Milk, the celestial tug-of-war iconic to Hinduism — the religion practiced off-and-on by the rulers of Angkor. Watch out for large wasps within the sanctuary. Wasps love ancient temples, an unfortunate universality I’ve come to terms with during my time in Southeast Asia. This is a carving of a kala, a jawless Hindu being that has been commanded to devour its own body. 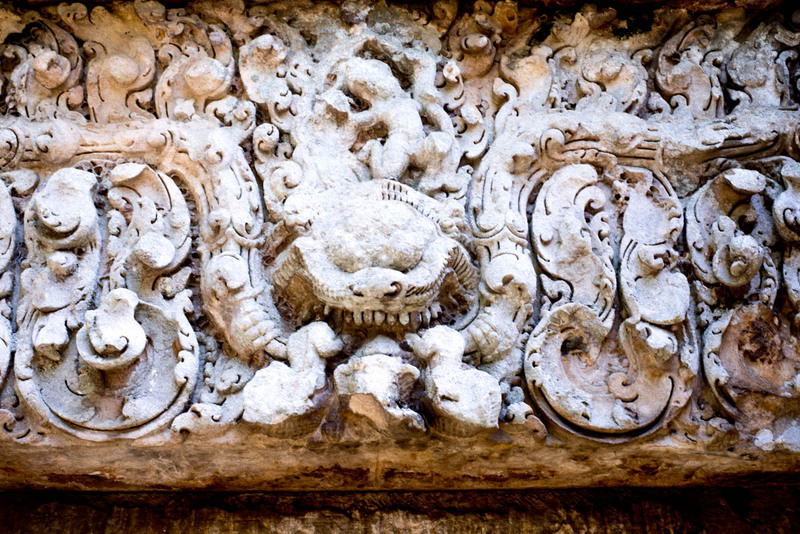 You’ll see variants on this motif in Bali as well for distinctly unsurprising reasons. A few kalas are present at Wat Ek Phnom, although the usual assortment of looters seem to have carried off most of the carvings found here. 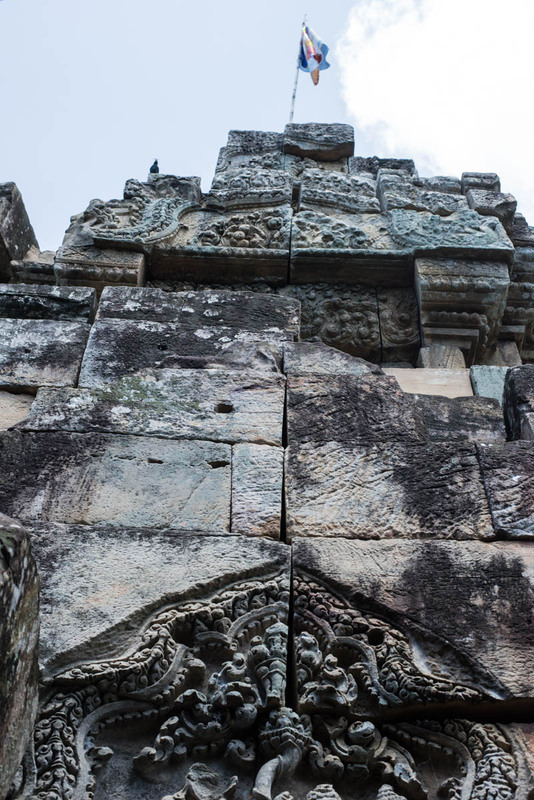 Like many Angkor-era temples, Ek Phnom still has religious significance in the modern-day. 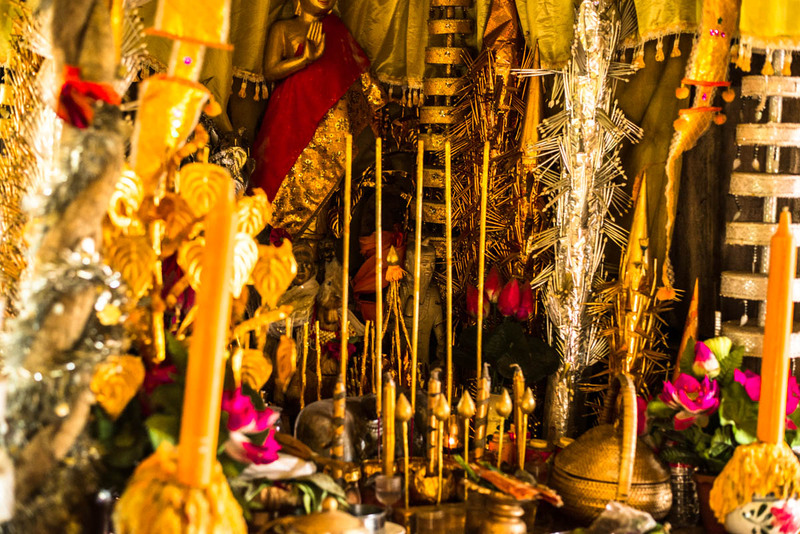 An ornately decorated gold Buddhist shrine within the temple’s inner sanctum is testament to that — you’re welcome to light some incense if you’re spiritually inclined, and there’s usually an attendant somewhere in the area. People still come here for holiday celebrations. The old baray (reservoir) is one of the better-preserved of Cambodia’s Angkor-era temples, and is full to the brim with lotus leaves, the occasional blossom, and a profusion of frogs and turtles. You can probably wake up a (bored) vendor for a Coca-Cola and some noodles if you’re so inclined. 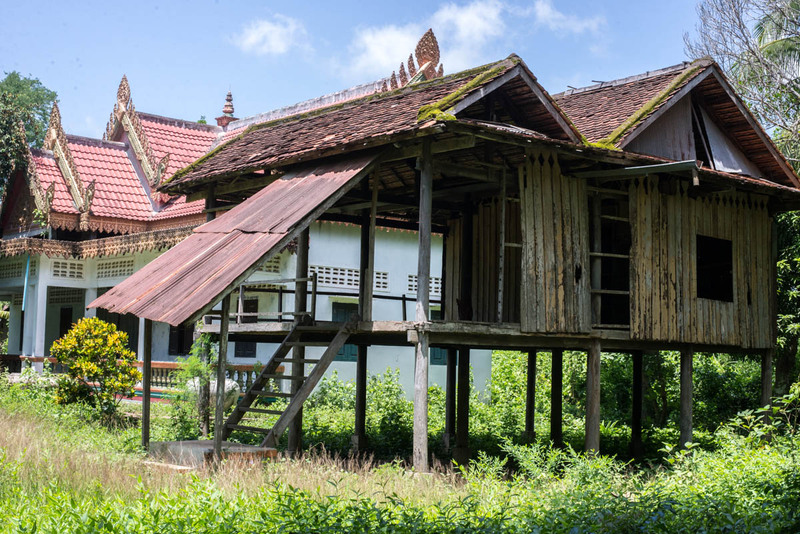 Walk past the baray and down the country road for a spell, past traditional wooden Cambodian houses, rice paddies, and the usual assortment of cows, water buffalo, and waving people on antique and creaky bicycles. In front of Ek Phnom is a newly constructed Buddhist wat, where I took this picture of the omnipresent naga motif. To the right of the temple is another, very much unmissable new building: an enormous Buddha statue that stands out impressively against the blue sky, stuck in the middle of a lotus-filled pond. Below the statue is a quiet concrete room full of Buddhist statuary. Stairs lead down to a flooded basement. Getting to Wat Ek Phnom by motorbike was easy, and proved a pleasingly green jaunt through agricultural Cambodia. It’s about thirteen kilometers north of Battambang. Follow the river away from the city until you reach a crossroads – there will be signs guiding you towards the temple. 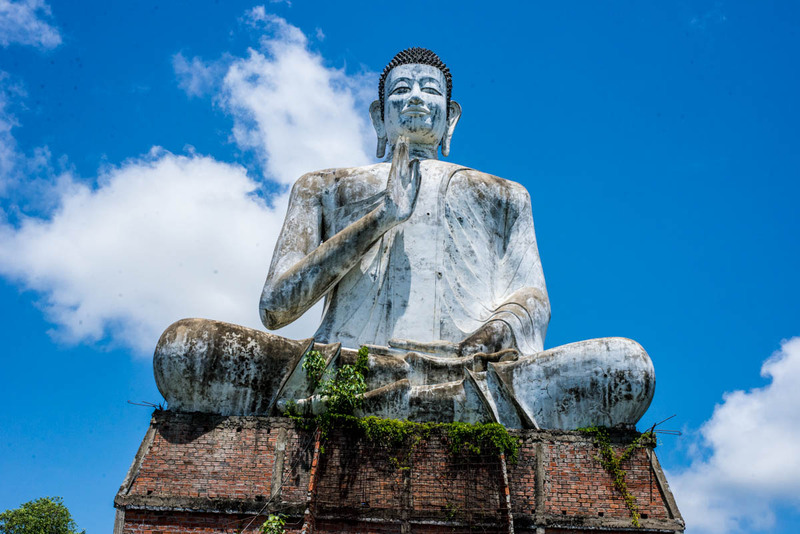 You will cross a small concrete bridge and then you’ll see the new temple, complete with an exceptionally large Buddha statue. The 11th century temple is behind the new structure. Park, pay a small entry fee, and have a look. If you’re not the motorbiking type, you can also hire a tuk tuk here from most anywhere in downtown Battambang with a tourist presence. Expect to pay around $10. In which I am horrified at the American media’s cynical obsession with a Burger King hamburger with four french fries stuck in it.